Last week, we looked at one of our final Arrandale laptops in the ASUS U41JF, a worthy follow-up to the U-series’ legacy. Today we have another ASUS laptop, this time one of the first dual-core Sandy Bridge systems to grace our test bench. The K53E comes to us via Intel, and they feel it represents what we’ll see on the various other dual-core SNB laptops coming out in the near future. Unlike the Compal quad-core SNB notebook we tested back in January, this notebook is available at retail, and it comes with very impressive performance considering the price, but there’s a catch. Intel has taken the stock K53E and fitted it with a faster i5-2520M processor, which should be a moderate performance bump from the K53E with i5-2410M and a healthy upgrade from the non-Turbo i3-2310M model. The i5-2520M runs at a stock clock speed of 2.5GHz with Turbo modes running at up to 3.2GHz; in contrast, the i5-2410M checks in at 2.3GHz with a 2.9GHz max Turbo, and the poor i3-2310M runs at a constant 2.1GHz. There are a few other changes as well, depending on which model you want to take as the baseline. The K53E-B1 comes with 6GB standard and a 640GB HDD, while the K53E-A1 comes with 4GB and a 500GB HDD; our test system has a 640GB HDD and 6GB RAM (despite the bottom sticker labeling it as a K53E-A1). Intel also installed Windows 7 Ultimate 64-bit instead of the usual Home Premium 64-bit, which means there’s no bloatware on the system—and ASUS’ standard suite of utilities is also missing. If you want a ballpark estimate of cost for a similar laptop, the Lenovo L520 has the same i5-2520M CPU, 4GB RAM, and a 320GB HDD with Windows 7 Professional 64-bit, priced at $826. Intel’s pricing on the i5-2520M is $225, so around $800 total for the K53E would be reasonable, but like most OEMs ASUS gets better pricing for the i5-2400 series parts and thus chooses to save money there. For most users, the stock K53E-B1 will be more than sufficient, as the extra 10-15% performance increase from the CPU upgrade won’t normally show up in day-to-day use—you’d be far better off adding an SSD rather than upgrading the CPU. Here are the specs of the laptop we’re reviewing. Like the U41JF, outside of the CPU we’ve already covered most of the items here. One new addition is the 640GB 5400RPM Seagate Momentus drive (previously we usually received 500GB models). With a higher areal density, sequential transfer rates will go up, but the random access speed is still going to be horrible. Also like the U41JF, there are quite a few missing features: USB 3.0, eSATA, FireWire, and ExpressCard are not here, so if you want any of those you’ll need to go elsewhere. The DVDRW, LCD, audio, and other items all typical features; the 0.3MP webcam makes the sacrifice of resolution in order to work better in lower light conditions. There are a lot of similarities to the ASUS X72D/K72DR we looked at in October, though we’re running an Intel CPU and using a 15.6”-screen chassis this time, and there’s no discrete graphics option. Of course, the HD 5470 is no performance beast, so Intel’s HD 3000 actually posts similar results (albeit with perhaps less compatibility across a larger selection of games). Also interesting is that ASUS is using a 56Wh battery in place of the 48Wh units that have been so common; hopefully that will be the case on all of their midrange laptops going forward, though we’re still partial to the 84Wh batteries in the U-series. The real purpose of this laptop is to get dual-core Sandy Bridge out there for the lowest possible cost. While the notebook as configured would probably need to sell for around $800, the K53E-B1 with i5-2410M is going to perform very similarly and will set you back $720. 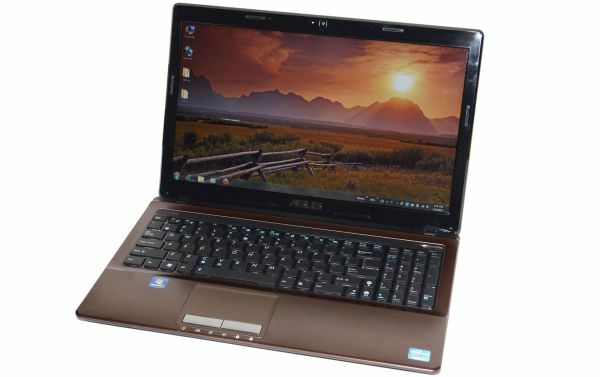 Because Intel performance a clean OS install, we also skipped out on the regular set of ASUS utilities. Power4Gear is about the only one we usually find useful, with the ability to power off the optical drive usually boosting battery life a bit relative to other laptops. Since we’re not looking at a stock K53E, though, we decided to just run the system as configured on both the hardware and software fronts. On the other side of the charts—literally—is AMD’s E-350. We know it’s not meant to compete with Sandy Bridge (or even Arrandale or Core 2 Duo), but keep in mind that the cheapest price for such a laptop is going to be around $450. On average, the i5-2520M lays the smack down hard and ends up roughly four times faster than an E-350. Ah, but the E-350 has a much better IGP, right? Exactly, which is why I mention Llano oh... about nine times in the article, and point out that it should double the Brazos IGP performance with a CPU that "is a huge step up in performance from Bobcat." As for Atom: "There’s little (well, nothing really) to recommend an Atom netbook over a Brazos alternative at the $300 to $350 price bracket." Elsewhere I make fun of netbooks (Atom) for being, "slow, often poorly built, slow, too small for many to use comfortably, and above all really slow." The point with the SNB vs. E-350 comparison is that lots of people rip on Intel's graphics as being unfit for just about anything. The reality is that if we take the same mindset, Bobcat is just as bad because the CPU is such a massive bottleneck that it can only muster average graphics performance that's slightly faster than Arrandale. In reality, without the CPU bottleneck (or RAM bandwidth bottleneck) I suspect HD 6310M would be slightly faster than HD 3000. But when SNB offers about twice the graphics performance and four times the CPU performance and 80% of the battery life, yeah, those are items worth mentioning. It's also about 50% more expensive, of course. I think the point duploxxx might be trying to make is that you intentionally compared Sandy Bridge against the E-350 to make it look bad. I understand the comments about AMD graphics being better than Intel's, but those were directed specifically at the Atom platform. AMD's E-350 destroys anything Intel's Atom platform can do, even with Nvidia's help. But what sets me off is how you don't hesitate to put it against Intel's flagship processors, but nowhere do I see Atom's results in the benchmarks. Fact: There are $600+ E-350 laptops available. Regardless of whether or not they should exist, they do exist, and as such it's a fair comparison. I didn't include Atom because it's not even remotely in contention -- and if I had C-50 results I wouldn't include those either. If people don't understand that we selected 12-15 laptops for the charts out of our catalog of over 80+ reviews, I'm not going to apologize. Use Mobile Bench and make your own comparisons. The conclusion talks a lot about the strengths of Brazos and AMD, but some people have a history of being strong AMD advocates in our comments. Every time I/we suggest that AMD might not be the best choice, they have to post a rant about how we're paid off or blind/stupid/[insert pejorative]. Read our Brazos reviews and you'll see we focused a lot of good attention on the platform, though we didn't hesitate to call out the weaknesses. "The conclusion talks a lot about the strengths of Brazos and AMD, but some people have a history of being strong AMD advocates in our comments. Every time I/we suggest that AMD might not be the best choice, they have to post a rant about how we're paid off or blind/stupid/[insert pejorative]. " Has it occurred that it's too obvious in front of everybody's eyes and that you particularly are not doing that great of a job in trying to deny the blatant bias in favor of intel?? There's no rudeness in his post and it's quite clear the bias towards AMD that you and the other two posters who are attacking Jarred have. Seems Jarred has a point made about AMD fanboys and comments. Learn to be more observant and aware before you make such biased and unfounded accusations. It's OEMs like Sony who are placing Brazos into a regular notebook form factor and pricing it within striking distance of the ASUS notebook. The point that should come across is that if you start looking at some unbalanced (perhaps even overpriced) E-350 options out there, its worth an extra $100 for overall better performance. There's no Intel bias here. And AMD fanboys need to face reality, AMD has a brief moment in the spotlight with K8 but Intel has been 1 or 2 steps ahead ever since Conroe. Even when comparing appropriate alternatives (based on SKUs), Intel wins. But you'll find lots of articles where the writers here Anandtech praise AMD, maybe not as much in the CPU market but quite often a lot in the GPU market where they immensely improved and given nVidia a lot of smackdowns that no one expected woujld come. To be reality is , don't trust the benchmark. it's not going to benefit you anything. It's only let Intel earn 86% in the market. i trust the benchmark , review . now i suffer in Dell N4110. it's doesn't perform well. I would said , value of money is most important. when u buy the new notebook , you can save RM3-400 ,why you need to buy Intel? it's wouldn't last you up to 3 years. your model will just out of date in another 9months. I will go back to AMD after i can let go this Dell N4110. Do you also believe that the Moon Landings were a staged hoax because the Astronauts gave up swearing to things that they were actually at the moon? Jarred, I agree with your reasoning for including the E-350. Some people are blinded by AMD fanboyism, it seems. I have a preference for AMD, but I think your comments are right on the money. I bought a Thinkpad X120e because I think that AMD did a great job reinvigorating the small form factor. At 15.6" the E-350 has more competition and the premium for Intel based solutions is lower, so I think it's a good idea to give buyers an idea of how it compares in this form factor. i would tell u , u wouldn't notice you are using E350 or core i3 2310. i totally dislike my Dell N4110 core i3 2310 . because the battery life is just 3hours . (normal price is RM1899 from Dell website , i buy promotion price from dealer , RM1.6k with HD6630 , 4GB , 500GB 7200rpm) E350 is about 6 hours & price is just RM1099. of course i wouldnt go for that model , because i need to play game , i need some model at least with HD6470. in fact currently Llano notebook is going crazy . pair with 6650 but only help the benchmark about 10% & the price is nearly to the core i5 model. core i5 2410 + GT540 RM2299. Llano sell RM 1800. Dell i5 2410 + HD6470 is selling RM1899.